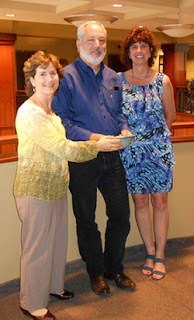 The Asheville Area Chamber of Commerce is pleased to honor OneWhoServices, Inc. as Small Business of the Month. Gordon Walton started OneWhoServes, Inc. in April of 2000 to provide IT services to small businesses in the Asheville area. Within 5 years, they had grown by word of mouth to two departments, one providing IT services and one developing custom database software applications for local nonprofit organizations. While OneWhoServes, Inc. got out of the software development business in 2010 to focus on their core IT services, several software programs they developed are still in use. About 35 nonprofits use the GiftsFriends&Time software to manage their donations, volunteers and fundraising activities. The case management and weatherization software they developed is in use in the 42 Community Action Agencies across NC. OneWhoServes currently serves as the outsourced IT department providing business technology services to over 200 commercial, medical, financial, legal, municipal, and industrial clients. In addition, they provide IT services with discounted rates to about 30 local nonprofits. "We love helping those who are helping others in our community," Walton said. "The cornerstone upon which we operate is building strong partner relationships with our clients. We listen to their needs, we learn how they think and work in their businesses, and we schedule service promptly. We believe that our Systems Engineers, with Microsoft, Cisco, and other certifications, are the strongest Information Technology team in Western NC. They are experts in servers, workstations, networks, data communications, software, security, mobile devices, and user issues in Windows, Linux, and Unix environments. We take care of all of the technology needs for clients ranging from one to hundreds of computers in one or many locations." Reffering to his team, Walton said, "We employ only experienced, senior Systems Engineers that are the best technology people in the industry. Every one of them knows that it’s the people and their businesses that are most important. They work together closely, constantly supporting each other to balance workloads and to share their knowledge with each other and our clients. Our office staff is equally strong, placing top priority on serving our clients and supporting the needs of our SEs at client sites. We are known for integrity, technology excellence, fast response times, security, and the best client service experience in the area." Looking ahead, OneWhoServes plans to continue to grow by adding new clients. The company is expanding their client base in the medical community through their combination of IT security and HIPPA expertise. "The needs of all of our clients are continually evolving as is the technology that we support," Walton said. "We strive to grow our expertise so that we know the best technology options for each client. With that, we can provide advice and education so they can make the best business decisions for their organizations." OneWhoServes has been an Asheville Chamber member almost from their inception. "We identify strongly with the tagline Connect. Engage. Impact. Thrive. We are first and foremost a relationship company, as reflected in our written Values Statement. We believe that the best service can be provided when in close relationship because we can learn how to tune our service to individual needs. Each of our staff members is passionate about service and is committed to the well-being of 'their' clients. With this level of engagement we can have the most impact in the community. We love that Asheville is a connecting, relationship-oriented city where small businesses can thrive and grow."